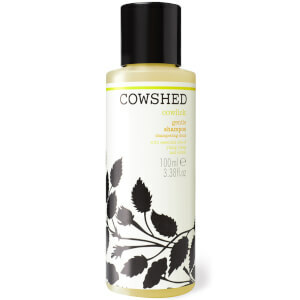 Refresh your locks with the Cowshed Cowlick Gentle Shampoo; a sulphate-free formula that effortlessly cleanses hair, whilst imparting a delicate scent. Suitable for all hair types, the cleanser massages into wet locks and works to eliminate daily dirt, impurities and product build up, without stripping hair of essential oils and moisture. The shampoo is enriched with Ylang Ylang, Lavender and Lemon Essential Oils, which work in synergy to refresh tresses, whilst Carrot Seed Oil envelops the hair and scalp in moisture. Expect touchably soft locks and a comfortable scalp. Free from parabens, petrochemicals, sulphates, artificial fragrances and colours. 100% Vegetarian. Not tested on animals. Massage into wet hair and scalp. Rinse thoroughly and repeat if necessary. Follow with Saucy Cow Softening Conditioner.